Track and manage your inventory while it is being returned, repaired, or exchanged. What is Return Material Authorization? Return Material Authorization (RMA) is the process used to ship broken, or defective items, back. 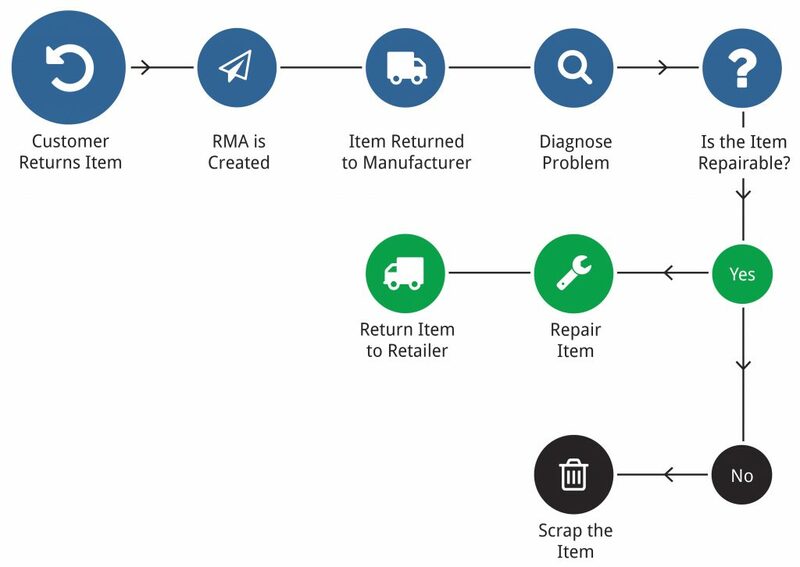 RMA is used during a warranty period to track goods so they can be returned, repaired, or exchanged. To have your business stand up against your competitors, you need to be able to manage your returned goods. RMA makes returns quick and efficient by allowing you to monitor the status of your returned goods. As a supplier, you can see the reasons for the return, check the validity of returns, and then manage the return to the customer, third party, or a repair facility. The Clear Spider system will create purchase orders, replacement orders, and vendor returns, to save you the time and cost of manual data entry. Serialization is an effective way to track your returned merchandise. Learn more here. This is just one example of what an RMA process could look like. Your organization may have different steps that need to be taken when items are returned. Clear Spider is a highly flexible system that can be customized to meet your unique business processes. Share RMA tracking information with customers so they can see the status of their returns. They will know when it is approved, received at the destination, and shipped back if it is a repair. Sharing this information helps improve your customer service level. When a return is made, information such as product location, and the reason for return, needs to be tracked. Clear Spider can help manage this information so you know what items have been returned, the reason for the return, and if it was shipped back to the customer. Customers can request returns within the Clear Spider system. They can choose a return for credit, replacement, or repair. The application process is fully integrated into our system so your company can receive and solve these issues as quickly as possible. When a return request is received in the system, it is automatically directed to the right individual for approval. The request can then be handled by that person in a timely manner. Having approvals integrated into the system avoids returns being lost, or sent to the wrong person. Clear Spider’s RMA function gives your quality assurance department access to product and return information. They can monitor this information and alert the appropriate people when quality issues arise and products need to be quarantined, recalled, or repaired. Quarantined products are items that have had their delivery interrupted due to recall, repairs, or inspection. Clear Spider lets you see the products that have been quarantined real-time so you can mitigate the risks associated with the purchase of those items.